Further, 2+2 articulation agreements contain very specific requirements which have been agreed upon and approved by the administration and faculty at both institutions. Because of this, petitions for course substitutions will not usually be considered or approved to allow a student to graduate under a 2+2 program. Students completing this option will receive an Associate in Applied Science degree from West Virginia Northern. Upon completing the additional credit hours required at WLU, they will receive a Teacher Education, Secondary Education degree with an English specialization. Complete a 1 credit course through WLU (EDUC 100 - Introduction to Professional Education), which is a twelve (12) hour field-based experience which includes direct instruction, simulations, and group discussions. Minimum grade of "C" is required. 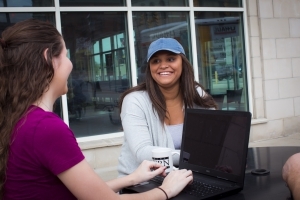 Students are encouraged to meet with members of the Teacher Education and English faculty at WLU early in their program of study at WVNCC to obtain information and advising concerning the program. Consult your WVNCC advisor for further information.